Loganberries, tayberries and blackberries in a row. Flanked by gooseberries, black and redcurrants and yellow raspberries. Our woven willow branch hedge took really well. From early May, we had heard the nightingale singing in the hedgerow at the end of our field. The trees were abuzz with bees and every little flying creature seemed to have nesting material in its mouth, or something wriggly! 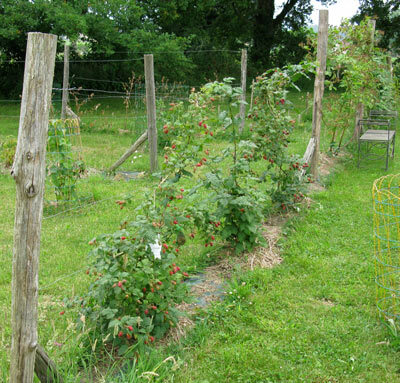 The fruit garden, now in its second year, began to show its potential as the different berry bushes all started giving fruit. The logan and tayberries were enormous. The yellow raspberries were so sweet, far more than the common red ones. The gooseberries took a beating when the deer found them, so were expending all their energy on surviving. Hopefully next year they'll be able to concentrate on producing something worth making a tart for! 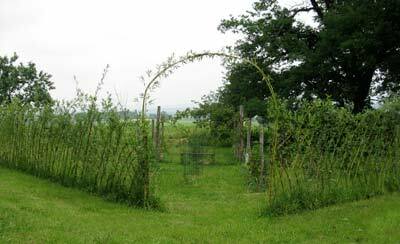 To that end, we'll hopefully be adding the other two sides to the willow fence we started in February. With the fruit garden enclosed, the deer and other animals won't be able to get to the bushes and strip them of bark and leaves. Our neighbours and friends are all aware that we'll be around next February to trim their willows and weave the harvest into decorative and effective fencing. Our friend Pierre dropped by to tell us that a house close to the lake was up for sale. The owner now lives in Pierre's village and was at the old house, clearing out the rooms and burning anything they didn't want. We dashed down with him and saw a beautiful old wardrobe crackling away on an enormous bonfire. We asked if we might look around before they destroyed the lot. A tour of the place revealed a time capsule, untouched by the last century. The kitchen was a huge fireplace with hanging pots over embers, a simple bench, a solid oak table and a candle. Our hosts said we could take what we wanted. So we went to get the trailer and returned to load another wardrobe and several wine barrels, of between 250 and 400 litres. The last was too big for the trailer; probably 1200 litres. 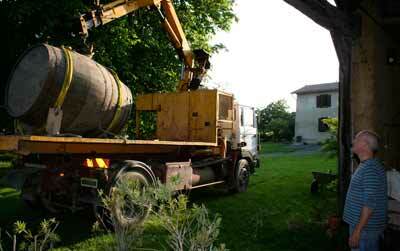 Pierre's brother was there with his truck and crane and kindly brought the barrel to our house. Our plan is to use it to capture rain water from the roof of the small barn and irrigate the fruit garden. 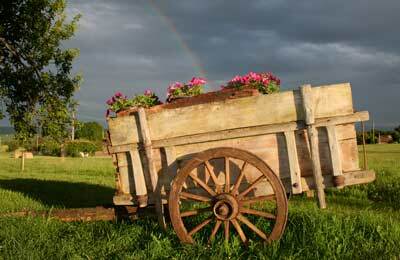 Pierre was also happy with some old farming machinery, wagons and other memorabilia. He has two large hangars full of classic tractors and paraphernalia. All working! Denis, the electrician, came over to install the lighting for our boules court. Perry had already made and placed the oak pillars and within an hour or so there were six low-level lamps throwing a glow over the court. Perfect for summer games that go on into the night. As a treat, we invited Denis and his electro-partner Jean-Christophe to stay for a game. 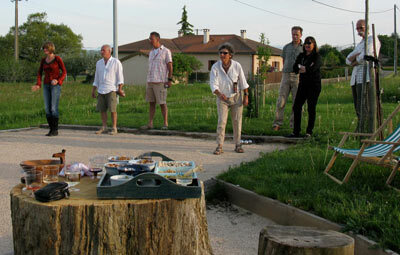 A beer and boules in hand, it was a swift affair. Both grew up with the game and showed us a trick or two. Since then, we have had several impromtu evenings at the court. Friends drop by, we stay outside, the lights go on and boules start to fly, followed by the occasional dash back to the house by torchlight, for wine and nibble refills. That nightingale's singing obviously worked. His female suddenly appeared very close to the house. We sat having lunch under the walnut tree when we saw here zip in and out of the hedge, very near to us. 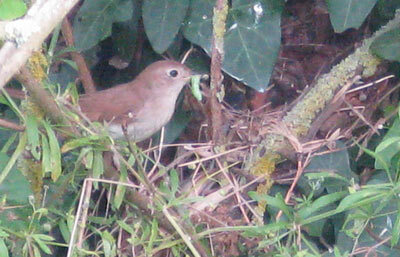 At first we didn't recognise the breed, since it is rare that you see a nightingale. That sorted, we watched where she went each time with a beak full of caterpillas and grubs. As she flew off, we quickly had a closer look and found four chicks in a nest just 30 cms from the ground. The next day we heard a high-pitched alarm call and ran outside. Just in time to see a jay flying off with a chick in its beak. The nightingale mother in distress, she made a lot of noise, but went back to searching for food for the rest of her chicks. Meanwhile Caroline decided to outwit the jay, who would obviously be back, with such a rich buffet on offer. She found some chicken wire and we formed a dome around the nest with just a small opening, big enough for the mother but too small for the jay. Of course, the mother couldn't work out how to get in at first, so clucked about for ages before she spotted the entrance. Problem solved we thought. Let's get on with making our own lunch. Suddenly another racket outside and we dashed out to see the jay inside the wire. We flushed it out but there were now only two chicks left. Our nerves were now just as rattled as the nightingale mother. A repair job on the wire and then Caroline went into sentry mode, setting up her deckchair near the nest, ready to scare the jay off should it come back. But it was very bold and still attempted to get inside, even pulling down on the nest which suddenly tilted, though both chicks remained inside. Later that day, we discovered that one chick was gone and was somewhere in the undergrowth, the mother clucking away to it and the jay in the tree above trying to get to it. We realised that this was a hopeless situation and reluctantly let them get on with it. 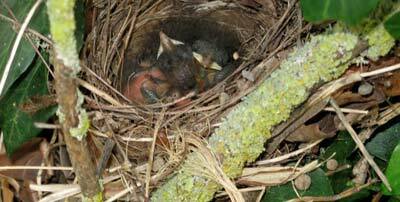 The next day we saw the last chick, dead in the nest. An upsetting episode, but the jay also had young to feed. 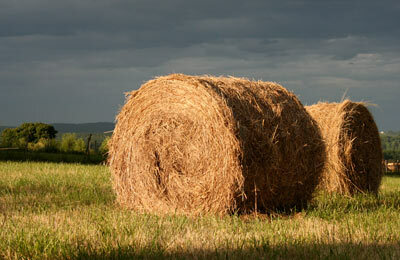 Living in the country, one is confronted so much more with the way nature works.